On our trip through Burkina Faso we stay in clean thoroughly selected 2-3-stars-hotels. The rooms have en suite facilities, electricity and water supply and air condition or fan. The hotels at Ouagadougou, Bobo Dioulasso, Banfora and Lake Kompienga have clean swimming pools. Airlines with scheduled flights to Burkina Faso include Brussels Airlines offering flights to Ouagadougou and from Ouagadougou via Brussels on Tuesdays and Saturdays. Air France offers daily flights to Ouagadougou and return flights except on Wednesdays from Ouagadougou via Paris. Another option is Ethiopian Airlines which has several scheduled flights per week to Ouagadougou and return flights from Ouagadougou via Addis Ababa. For further information regarding flights schedules, reservation, connection flights and other questions related to your flight please consult the airlines’ websites: www.brusselsairlines.com, www.airfrance.net, and www.flyethiopian.com. The itinerary of our group guided tours with fixed departure dates matches the Air France flight schedule. If you choose another airline there may be modifications to the itinerary and/or additional cost due to extra overnight accommodation and extra transfer expenses. If you book a tailor-made trip with us you can fly the airline of your choice. We will be pleased to provide you with a regarding your reservation. Burkina Faso is divided into three climatic zones, the Sahelian zone, situated in the north of the country, south to it the Sudano-Sahelian zone and the Sudano-Guinean zone which covers the south and southwest of Burkina Faso. The country has a primarily tropical climatewith two alternating seasons: a long dry season and a short rainy season. In the Sahelian zone, covering about 25% of the country, the rainy season runs sometimes only two months with maximum rainfall of up to 300mm a year. The Sudano-Sahelian zone is the largest climatic region, covering half of Burkina Faso. The rains in this area tend to start in May/June and to dry up in September/October. Rainfall figures are highest in the Sudano-Guinean zone which receives up to 1,300mm a year. The rains here tend to start in May and are over by October. The temperatures average between 25°C and 30°C, March, April and May being the hottest months. Burkina Faso is coolest in January and February. During the dry season the harmattan winds blow, bringing dust from the Sahara. Light short-sleeved cotton clothing is recommended for the days and a long-sleeved shirt and trousers for the evenings which will help you to fend off mosquitoes and face the cooler temperatures.In Burkina Faso shorts and short skirts are ill-advised for women. It is also unusual for men to wear shorts in Burkina. In the rainy season you need a waterproof jacket and/or an umbrella. (see chapter “climate”). In many hotels there is a laundry service on offer, so you can get your washing done. As for footwear, you should carry with you a good pair of walking shoes for our hiking tours in Banfora and a pair of sandals. Thongs are useful in shower and pool areas. Don’t forget your swimwear! You will have the opportunity to swim in the sea, and some of our hotels have clean swimming pools. International and national calls can be made from post offices and hotels. The prefix for UK is 0044, for USA and Canada 001, for Burkina Faso 00226. As in many other African countries, the mobile industry in Burkina Faso is booming, and coverage is excellent across the country. For detailed information please contact your provider prior to departure. If you have a GSM phone and it has been „unlocked“, it is possible to buy a local SIM card for about 7$ and buy top-ups. International calls to UK and USA cost about 400 to 500 CFA per minute. Internet access is widely available in Ouagadougou and prices not expensive, although connections are often slow. 220 volts alternating current. Generally, you can recharge your batteries in your hotel room without a problem. Burkina Faso uses two-pin continental-style plugs, so you will probably need an adapter. US citizens may also need a voltage converter. Please note that power cuts are frequent. The Burkinabé staple is the rather tasteless tô, a maize-, millet- or sorghum-based dough mixed with water, that is usually combined with a vegetable sauce or a sauce made of ladies’ fingers, baobab leafs or groundnuts. These sauces are also served with rice and couscous made of fonio or cassava. The sauces can be quite spicy. Riz gras is another popular dish consisting of rice fried in oil with tomato paste and onion. It is usually served with fried fish or meat. Fufu is a popular starch-based staple originally from the coast. There are also plenty of meat dishes on offer. Beef, mutton, goat, chicken and bush-meat are available throughout the country. Guineafowl known as pintade in French and fish are often seen on menus in Burkina Faso. Popular side dishes in restaurants are fried plantain known as aloco and fried sweet potatoes or yam. Caterpillars are a popular food source as they are rich in protein. Tap water should be boiled or filtered before you drink it. In all bigger cities you can buy mineral water in bottles. You should try bissap, a thirst-quenching juice made of the purple petals of the hibiscus flower. Other tasty juices are available like tamarind or ginger juice and depending on the season baobab juice. Beer is also produced in Burkina Faso, the most popular brand is Brakina. Locally brewed millet beer known as dolo or chapalo is available in the villages. A Yellow Fever vaccination and certificate is a compulsory requirement for entry into Burkina Faso (see visa requirements). You should always carry the certificate with you while being in Africa. Keep away from street dogs, monkeys and other mammals that could carry rabies. Avoid bathing in standing bodies of water because they are high-risk areas for bilharzia. The CFA franc (Communauté Financière Africaine) represented on international banking systems by XOF, is the currency of Burkina Faso. Exchange rates are $1 = 521 CFA (July 2012), £1 = 817 CFA (July 2012), €1 = 655.95 CFA. The CFA franc is pegged directly to the Euro. Notes are in denominations of CFA 10,000, 5,000, 2,000 and 1,000; coins come in CFA500, 250, 200, 100, 50 and 25. Coins of CFA 10 or 5 exist, but they are extremely rare. Banking hours in Burkina Faso vary according to the bank and its location. Generally speaking, most of them open very early, close for a long lunch break and reopen in the afternoon, so you should be able to find an open bank from 07.15 to 11.00 and from 15.30 to 17.00, Mondays to Fridays. You can change cash money in banks, some hotels, foreign exchange bureaus (Bureau de change) and in some Lebanese supermarkets (like branches of Marina Market). The best hard currency to bring is euros, some banks and money changers also change US dollars. In Ouagadougou and Bobo Dioulasso BECIA-B and SGBB banks are equipped with ATM machines, allowing you can withdraw money using your Visa card. The banks in other towns do usually not accept foreign credit cards. Cashpoints are sometimes not working or malfunctioning, so do not count on them. Please note, that most banks and cashpoints only accept Visa card. Mastercard, American Express or other credit cards are rarely accepted. Only very few big hotels, restaurants or supermarkets, such as Marina Market accept payment with credit card. EC Maestro card is an absolute no-go everywhere in Burkina Faso. While travellers’ cheques offer a greater security, changing them can be time consuming and commission is very high. You will be asked to produce both your passport and the receipt you get from your bank when purchasing them. Travellers’ cheques are only accepted by some bigger banks. They should be issued in euros or US dollars. Burkina Faso is a real treasure trove for passionate photographers. Whether the colourful dwellings of the Kassena, the rich wildlife at Nazinga Ranch or the castle-like houses of the Lobi, there are countless photographic subjects. Before you snap people please ask permission. A small friendly conversation can help you to break the ice and win your subject’s sympathy. Particularly in the animistic parts of the countries there are sacred places where photography is not allowed. Please follow your local guide’s instructions. Some places charge a photo fee (e.g. Nazinga Ranch). Taking pictures is not allowed inside the museums. It is strictly forbidden to take pictures of military buildings and people wearing uniforms, airports, dams, bridges, power plants, police stations, control posts along the roads and border posts! Demonstrations have been occurring more frequently in Burkina Faso since February 2011. Although the situation has since calmed down again you should avoid all demonstrations and public gatherings. Unfortunately the crime rate has increased in the past few years, so travellers should be vigilant. There is no British Embassy in Burkina Faso. The British Ambassador to Burkina Faso resides in Accra. Office hours: Monday - Thursday: 07:30 to 15:30, Friday to 13:00. There is a British Honorary Consul, Mr Patrick de Lalande, who can only offer limited consular assistance in an emergency. Monday, Wednesday, Thursday: from 2:00 pm to 4:30pm, Tuedsay: from 8:00am to 4:30pm, Friday from 8:00am to 11:30am. Burkina Faso’s time zone is UTC/GMT + 0. As they do not observe daylight saving time they are one hour behind in summertime. Although entirely voluntary, tipping is a recognized part of life in Africa. In the more well-to-do restaurants you can tip 5 – 10% if you were satisfied. For hotel tipping guidelines are as follows: for porters 100 CFA for one piece, for housekeeping 200 CFA per person per night. At your discretion you might also consider tipping your driver, tour guide and local guides in appreciation of the efficiency and service you receive. Please note, that for this trip you need to have 2 empty pages in your passport. Please note that a Yellow Fever vaccination and certificate is a compulsory requirement for entry into Burkina Faso (see chapter “Health”). The certificate is often checked upon arrival. Visas are required by all nationalities. Passports valid for a minimum of six months beyond date of departure are required by all. Visas are issued in countries with Burkina Faso representation. • Two passport-size photos (attached to form). Please submit all the documents to above mentioned address. Visas are normally valid from the date of entry. 3 Working days required. If papers are in order, visas are issued promptly. Visas are issued within 72 working hours. Express visa (within 24 hours) on request for a supplement of $ 50 per visa. 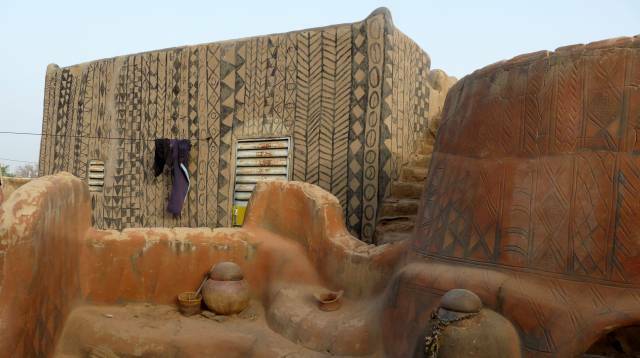 … Burkina Faso is a wonderful country to visit, but remember that Africans have a different perception of time. A trip through West Africa requires a high degree of flexibility, patience and tolerance, western standards regarding service, punctuality, comfort and hygiene cannot be applied here. Although we thoroughly choose our vehicles and use only vehicles in good condition, flat tires or other car breakdowns can happen. The road conditions in African countries can change unexpectedly due to heavy rainfalls requiring a detour or bridges can suddenly become impassable. We do our utmost best to ensure a smooth journey but please understand that delays may occur. Technical defects or service inconveniences in the hotels such as the lack of towels can often be rectified within a few minutes. In case of any inconvenience please contact your tour guide!